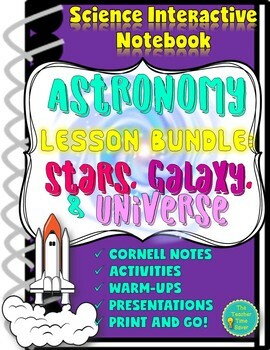 This product includes Cornell notes, a foldable activity, a presentation on the lesson, and a mini quiz built into the presentation on the Big Bang Theory, formation of the solar system, and the expansion of the universe. This product is part of my Astronomy Unit 3: Stars, Galaxy, and the Universe. This is a FREE pacing guide for the Astronomy unit: Stars, Galaxies, and the Universe. It outlines the following: lessons, main ideas, vocabulary, essential questions, and a resource. There is also a two-page lessons strategies handout to help support teachers who purchase my unit or lesson bundle. This Astronomy Lesson Bundle focuses on stars, galaxies, and the universe and includes four lessons. Each lesson comes with a set of Cornell notes (differentiation provided), an activity, a presentation, warm-up, and a mini quiz built into the presentation. This product is part of my COMPLETE UNIT BUNDLE: Astronomy Unit 3: Stars, Galaxy, and the Universe. This product is part of my Astronomy Mega Bundle (Units 1, 2, and 3). Want the COMPLETE YEAR OF EARTH AND SPACE SCIENCE?! Check out my Earth Science entire year bundle! Want to go digital? Check out my Digital Google Drive Notebook- Astronomy: Stars, Galaxies, and the Universe. It is printable too! -Anticipation Guide/Warm-Ups: Ten true or false statements to identify what students know, what they think they know, and what they will learn. A presentation follows along printable lesson. An answer key is provided. Each anticipation guide question follows their according Cornell and presentation to review the answer and acts as a warm-up. -Cornell notes: Five Cornell notes are provided. There are two versions: filled and fill-in-the-blank for students to complete. A presentation follows the Cornell notes and leads whole class, direct instruction. A summary section is included where students answer essential questions. A drawing section is made available for students to add their own drawings or pictures from the presentation. Each criteria is worth one point making each Cornell worth five points. -Activities: Five activities follow each Cornell notes in order to support and reinforce students' understanding of the content and provide students an opportunity to think critically by creating something new with the input received from the notes. There are five criteria: written portion, art, color, reflection component, and an “excellent." Each criteria is worth one point making each activity worth five points. -Presentations: Presentation guides direct instruction as students follow along and complete their Cornell notes. Presentation revisits anticipation guide statements at the beginning of the lesson and at the end (serves also as warm-up), has built-in mini quiz at the end of each lesson to check for understanding (5 multiple choice questions with answers), pictures to help learn the material, and starter sentences to support students complete the summary section of their Cornell notes. This is a PDF and is not editable. -Grading: For easy grading, simply circle missing components or stamp to designate full credit. It’s that easy--I don’t take any grading home and I’m out of the door when the bell rings after school!! 1. Make sure to extract file in order to open the zipped file. 2. Purchase license to share if more than one teacher will be using this product. Keep in mind this product took time to create with the teacher and student in mind. Thank you for understanding. 3. This product is not editable unless noted. 5. This product is part of a unit bundle: Astronomy Unit 3: Stars, Galaxy, and the Universe. If you purchase this product and the the unit bundle, you will be purchasing duplicates. Buy the unit bundle and save money! 1. Physical Science Complete Year Bundle! 1. Earth Science entire year bundle! 1. Biology Complete Year Bundle! Be the first to know about store discounts, free products, and product launches! All new products will be half off the already reduced price for the first three days it is posted. Just click the green “Follow Me” star under my store name on this page or click the “Follow Me” star under The Teacher Time Saver. Don't forget to leave a review too!